What the race has been missing is a trustworthy figure to reassure voters that they still have a fair shot at the American dream. Between Sen. Elizabeth Warren's array of complex policies and Beto O'Rourke's minimalist policy approach, there is a happy middle ground for a clearly defined message that neither overwhelms audiences nor leaves them wondering what the candidate is all about. That's the target, I would suggest, for former vice president Joe Biden, who is expected to enter the 2020 presidential race in early April. He is fortunate to start with a well-defined public image associated with working- and middle-class opportunity. His strength with organized labor, African-Americans, seniors, and both suburban and urban voters gives him perhaps the broadest swath of potential support in the party of any contender. In a race where no candidate has yet come up with a pithy theme aimed at all factions of the party, Biden will have the megaphone, the money and the name ID to provide coherence, a quality lacking in many other candidates' appeals. "Biden is hoping to seize command of the highly-fluid contest through major endorsements, a message of strength and an argument that the party's most urgent task should be defeating President Donald Trump," CNN reports. 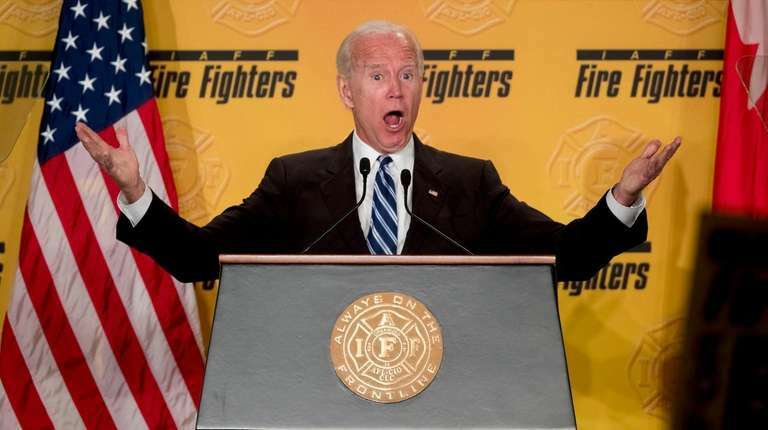 "Biden's team has started gaming out scenarios for what a campaign launch could look like with Wilmington, Delaware, and Scranton, Pennsylvania, where Biden was born, among several potential locations floated for an announcement rally, a source with knowledge of the discussions said. While the rest of the Democratic field settles into place, Biden's allies say the former vice president is keenly aware of the attention any announcement will draw." What's a potential theme that ties together Biden's record, a critique of Trumpism and all factions of the Democratic Party? Fairness. Think of it as a positive version of Warren's negative critique (that the system is "rigged"). Ordinary Americans want a fair shot at getting a good K-12 and college education (which we've seen is heavily gamed by the rich) and earning a decent living for a 40-hour week, getting access to the same health care that the wealthy can afford. It's not fair that the rich pay taxes on capital gains at a lower rate than the working class does on income. It's not fair that the discretionary spending that benefits ordinary Americans (e.g., national parks, the latest medical research, safe roads and bridges) gets slashed to fund even more tax cuts for the rich. And it sure isn't fair that the men and women in the military do without construction projects so Trump can build a useless wall to please his white-grievance base. In sum, the issue is no longer less or more government but what government is to be used for. Biden thinks the working-class family in Scranton and the teacher in Michigan, not the Trump billionaire class, should be the beneficiaries of government, a well-run government at that. This is a message Sen. Sherrod Brown, D-Ohio, could appreciate. What the race has been missing is a trustworthy figure to reassure voters that they still have a fair shot at the American dream. If that's not a tailor-made message for Biden, I'm not sure what would be. Jennifer Rubin is an opinion writer with The Washington Post.